There are a lot of reasons why you might require a roof replacement in Tempe. From frequent exposure to triple-digit temperatures to discovering damage to your roof caused by broken tree branches, a lightning strike, or simple wear and tear, the simple truth is that most of us don’t plan or expect to replace our roof. Whether you live near ASU or have a light commercial building located near the tech center, a dependable roofing company like AZ Roofing Works can complete your replacement project on time, with a focus on quality, and within budget. 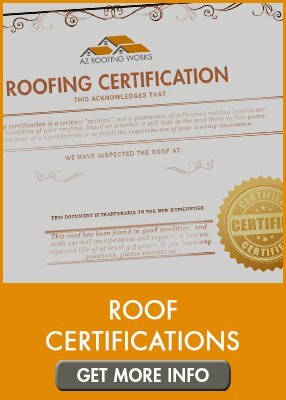 AZ Roofing Works is dedicated to completing high-quality roof replacement and repair services in Tempe. Our team of licensed, insured, and bonded roof replacement and installation experts focus on quality in every phase, from the initial consultation till we complete clean-up and the final inspection. Our team always acts in a professional manner, and complete detailed clean up when we are finished. Tile roofing is not only incredibly stylish, it’s also considered to be the most durable of all roofing materials. When professionally installed and using the highest-quality tile materials – a tile roof can last more than 50 years of extreme Tempe weather conditions. 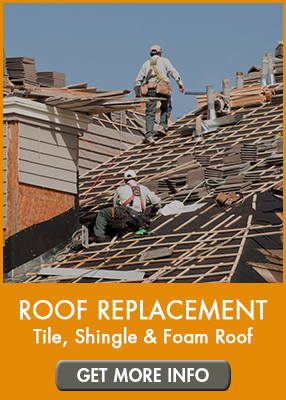 However, there are a few items that can expedite a tile roof replacement project, such as extreme weather, tree damage, lightning strikes or simple wear and tear. 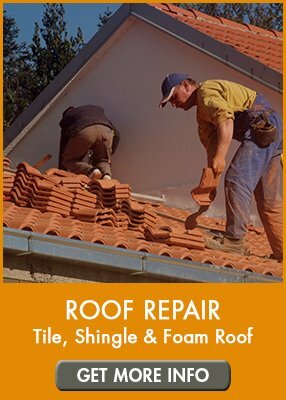 AZ Roofing Works has the resources and experience to complete your tile roof replacement in Tempe quickly and efficiently. We can secure high-quality tiles made from clay, concrete, composite, metal, or Spanish style. We can even mix and match materials to suit your individual taste or HOA compliance. Tempe has many residential communities with homes built more than 30 years ago. Most of these homes have shingle roofs. Today’s modern shingle roofing material is made from polymers or asphalt – with many of them including fire prevention materials. Shingles are lighter than tiles, and as such, tend to have about half of a lifespan. If your shingle roof in Tempe is damaged, and you’re not sure whether it can be repaired or needs to be replaced, contact AZ Roofing Works – so we can inspect your roof and provide you with an accurate and ethical estimate. The third most popular type of roof in Tempe is the flat or foam roof. A flat roof is designed much differently than a tile or shingle roof. There are also multiple material types used in a flat roof such as BUR (build-up roof), modified bitumen, foam, and PVC – each of which requires specific installation and replacement procedures. Like the shingle roof, a flat roof is prone to earlier wear and tear and will require a flat roof replacement in Tempe eventually.